Melodrama is one of my favourite genres. 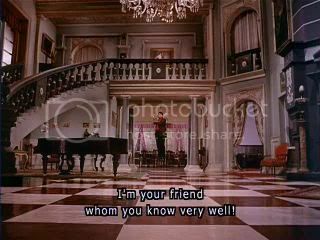 While I like my masala-movies, from time to time I feel the urge to watch good-looking people in beautiful surroundings making each other's lives miserable. Aadmi is wonderful for this. The title sequence presents us with ominous music and a shot of a place which just might become important later in the movie. Rajesh is generally regarded as a very nice person indeed. He is devout, cares for his workers, and has a devoted servant who gives him a flower every morning. 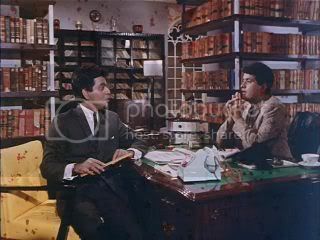 Being a good person he has to date failed to fire his creepy accountant, Mayadas (Pran), who constantly tries to create rifts between Rajesh and the other employees, including Girdharilal (Shivraj) who supervises the forests. Mayadas, however, is not the only fly in the ointment. There is also a disgruntled gentleman with an as yet unkown grievance, who his restraint by the other workers. 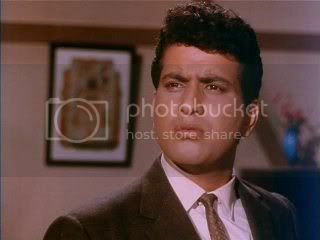 Before things get so serious (don't worry, there is plenty of serious awaiting us later) we are introduced to Shekar (Manoj Kumar). He is a medical student, about to sit his final exams, and son of an old (now deceased) servant of Rajesh's family who lives with his mother (Sulochana Latkar). He also is going to compete with Rajesh and various other people in a car race. Given the fact that Rajesh has paid for his education and that the family served Rajesh's family for generations, his mother guilts him into letting Rajesh win the race. During the race, we meet two more members of Mayadas's family, his son and our requisit comic relief, Premdas (Aghga) and his daughter Aarti (Simi Garewal). Both like Shekar a lot and want him to win, and it becomes obvious that Aarti is very much in love with Shekar. 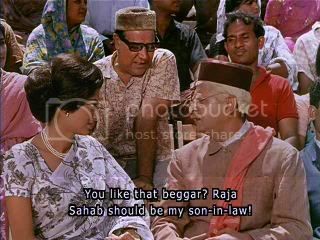 This doesn't go down well with her father who wants her to marry Rajesh, as he is rich. 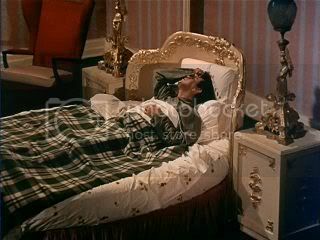 That night Rajesh can't get to sleep and is haunted by a voice (presumably we hear part of his interior dialogue) which tells him how much better Shekar is, and what a bad person Rajesh is. It also mentions his childhood friend Babu. As a result, he goes to a room with a very impressive cupboard from which he retrieves a doll and a photo album. 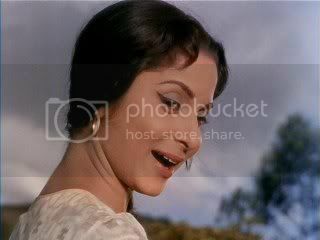 The first song introduces us to Meena (Waheeda), though we don't get to know her name till later. She is in love with Shekar whom she meets daily, but she likes to be mysterious and hasn't told him who she is or what she is called. She also has a good sense of humour and appears to be generally fun to be around. 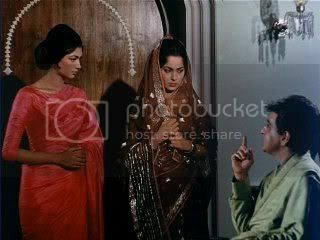 One day, when coming back from running around trees with Shekar, Meena overhears a conversation, which indicates that her sister Parvati (Padma Chavan) is secretly married to Mayadas's son. 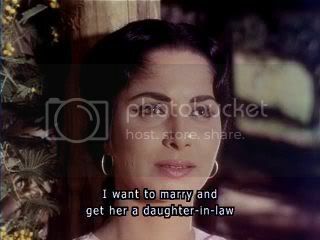 He suggests they elope, but she doesn't want to elope, she wants to become a proper daughter-in-law (why she wants to live in the creepy accountant's house is anybodies guess), however, her family doesn't have the kind of money Mayadas would demand in dowry. Meanwhile, Shekar has become a fully qualified doctor and Rajesh has employed him at the hospital he funds, together with Aarti. I do love Meena's reaction to him telling her that he found a job: it is basically "Oh my, the poor patients." 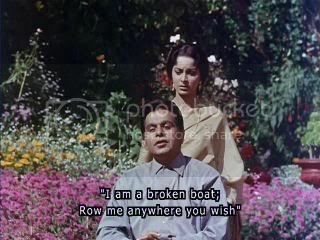 Shekar propses to Meena, whose name he still doesn't know (this is a rather crucial fact), but she asks him to wait for a bit, as there are problems at home at the moment. 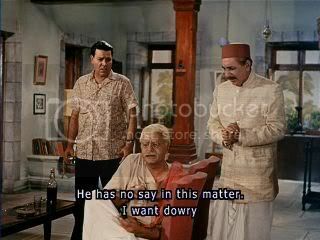 He agrees, but everybody's habit of never mentioning any names when talking about future daughter-in-laws results in Shekar's mother assuming that he wants to marry Aarti, a choice whith which she is very happy. Mayadas is not happpy about Arti's wish to marry Shekar, and he is about to show just how far he is going to go to make sure that marriage never happens. 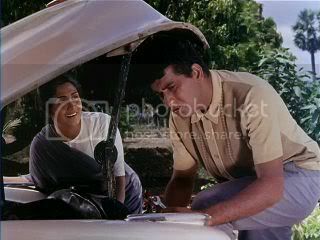 When he sees Shekar in repairing his car at the road side, he decides to get rid of this obstacle to his plan's of Aarti's marriage with Rajesh once and for all, and runs him over. Shekar his, however, seriously injured and urgently needs a blood transfusion. Of course, the hospital has run out of his blood group, and equally of course, it matches Rajesh's. 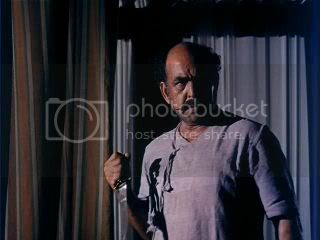 That night, while Rajesh is still feeling a bit wooly headed from the whole blood transfusion thing, he finds the dissatisefied worker from the beginning in his bedroom brandishing a knife. He accuses Rajesh of being responsible for his daughter's death but leaves without attacking him after Rajesh's manages to calm him down somewhat. 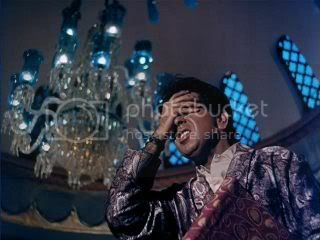 Rajesh is clearly rattled by this incident; who wouldn't be, and he goes again to the enigmatic cupboard. 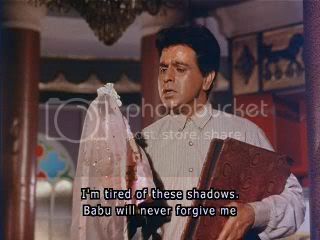 While he looks at the doll a voice can be heard, telling him that he killed the little girl (which he didn't) and accuses him of being a bad friend and that Shekar will betray him one day. Rajesh's is clearly distressed about this, and we still don't know what his childhood fried, who is mentioned again, has to do with any of this. 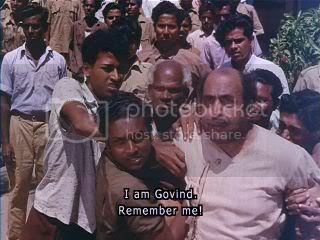 The whole conversation ends with Rajesh firing a shot into the ceiling, and the flower bearing servant from earlier on in the movie arrives on the scene. 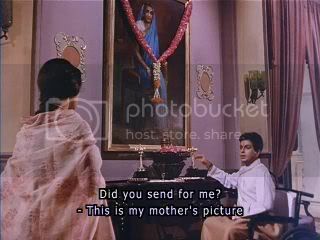 However, he does't mention the shot (maybe this is a more frequent occurence) but has come to report that Shekar's mother is unwell. 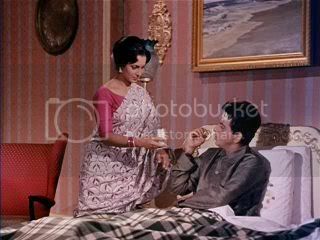 As Shekar is still resting Rajesh goes to look after her, and the two bond. Before the movie throws any more puzzling and/or guilt-inducing incidents our way, we are treated to another song. It is quite similar to the first one that in featueres Meena happily running around trees, but she is so lovely, I really don't mind at all watching her. 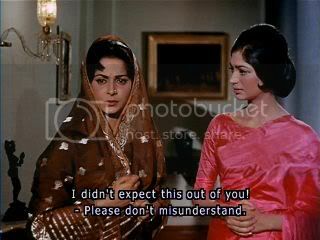 Meena is not very impressed when she finds out that he watched her. She doesn't know who he is, and she is very rude about the estate owner, who is none other than Rajesh. He seems to be puzzled but largely amused by her spunky attitude. Back at Meena's home things have taken a turn for the worse, as her father has found out that her older sister is secretly married. He tries to go and sort things out with Mayadas, but he won't have any daughter in law who doesn't bring a substantial amount of money to the family coffers. Ghadarilal isn't taking this news very well at all. Rajesh finds out about the situation, and offers to sort things out with Mayadas, an offer Ghadarilal accepts gladly. 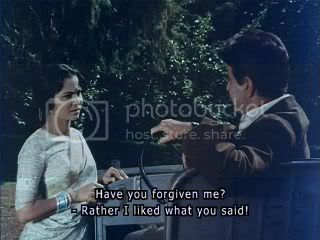 Meena is most embarrased when she realises who she was insulting just a little earlier, and tries to apologise, but he tells her that he actually liked her talking back to him. 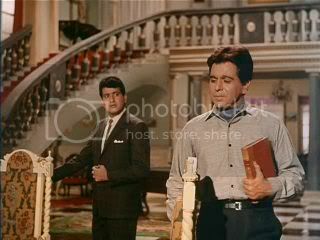 That evening, Rajesh (who obviously skipped the chapter "Musical instruments -- appropriate use of" in the guide to filmi cliches) is happily playing the piona, and when Shekar, who is still staying with im, remakrs on his unusual good mood, he reveals that he has fallen in love. It is going to be a surprise all right. I am not so sure aobut the sweet. Shekar is very glad for his friends and decides to take it about himself to arrange the marriage. He talks to Meena's father, when he comes to the house the collect the money for his older daughter's wedding, and it isn't till he goes over to her house with presents on Rajesh's behalf, that he realises just what he had done. Meena isn't happy either, when she hears of the prospective match, but being a good daughter, and given her families obligations towards Rajesh, she goes along with the plans. 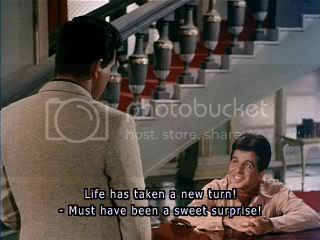 Shekar then sees himself confronted with his inner voice on the way back, and in the struggle between his love for Meena and his friendship with Rajesh (plus Rajesh having paid for his education and saved his life), the latter wins. He also decides not to tell Rajesh about his feelings for Meena, as that would hurt him. 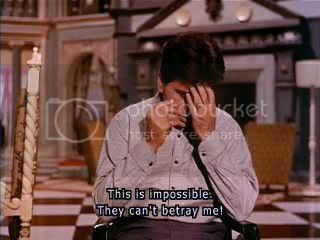 This promptly leads to a very akward situation in which Rajesh, who knows that Shekar is in love, suggests a double wedding, so Shekar tells him that his girl has accepted another proposal, without revealing who this person is. We then get a nice song to honour Rajesh's and Meena's engagement, with more happy piano playing, even if neither Meena nor Shekar look particularily thrilled. 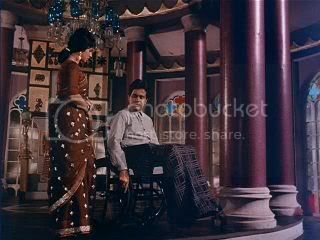 It is also agreed that Meena should stay at Rajesh's house, in order to learn the running of a big househol. That night, the two meet by chance as Shekar is about to leave for his own home. Meena wants to tell Rajesh about them. She is willing to be his wife, but she feels uncomfortable about not telling him about this previous relationship. Shekar insists that she shouldn't do it, as Rajesh isn't entirely stable and might not recover from a blow like this. Then Rajesh turns up, and he insists that Shekar stick around till after the wedding. 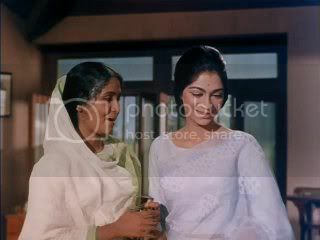 Some time later, Meena is visiting her sister in her new house. Parvati isn't treated particularily well by her father in law (not that that is a surprise) but at least Aarti defends her. 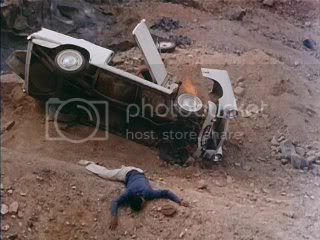 Mayadas still isn't reconciled to the fact that Aarti isn't marrying Rajesh, so he tampers with Meena's car. 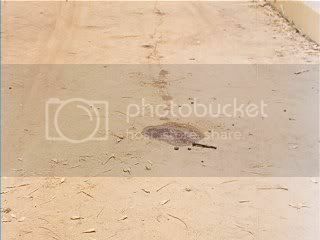 Unfortunately, well, for him, not for Meena, she stops and picks up Rajesh on her way back home and when they continue their journey Rajesh is driving. The little scene at the lake also seems to indicate that Meena is slowly warming towards Rajesh. 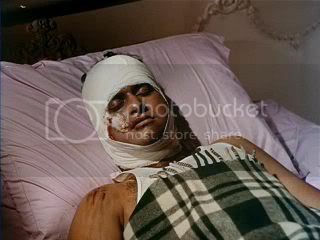 Don't worry, after the interval we learn that Rajesh did survive the accident. 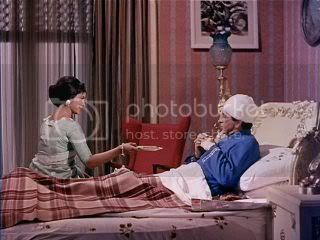 She proceeds to show him that she doesn't accept his decision not to marry her by looking after him while he recovers from his injuries. Given the fact that Rajesh loves her, it is not surprising that there is no more talk of breaking of the engagement. Instead, once Rajesh has recovered as far as possible he sings her an extremely melancholy and rather emo song. After all this seriousness, it is time for some comic relief. 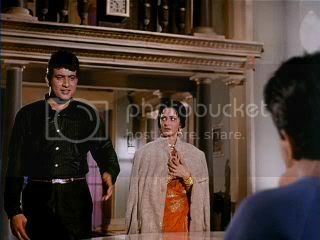 Premdas tries to get to his father's money by impersonating a bear. No, it doesn't make much sense, but it is a break from the relentless noble renunciation and suffering going on between Shekar, Meena and Rajesh. It also brings us back to Mayadas, who still hasn't given up on getting his daughter married to Rajesh. He is nothing if not persistent. When he sees Meena and Shekar together, he decides to tell Rajesh about how close those two have become. Rajesh tells him that he trusts them, and in fact asked them to attend a wedding together, as he doesn't like to go out in his current state but he didn't want to deprive Meena of the entertainment. 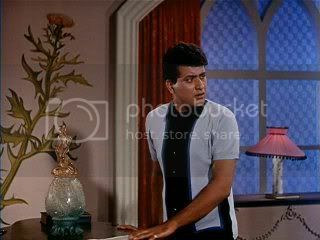 However, he becomes suspicious when Meena and Shekar return very late and very wet, due to their car having broken down on the way back. 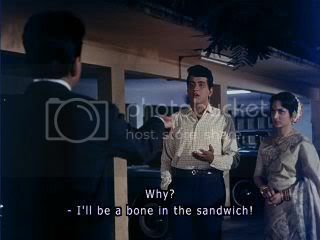 The next day, Rajesh gives Meena his mother's wedding finery as a present and asks her to wear it. 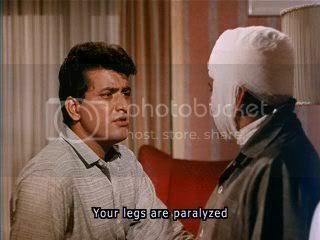 As she goes to be changed, Shekar arrives with the good news, that there is a treatment available for Rajesh's legs. 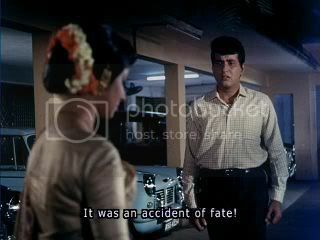 Shekar is shocked when he sees Meena in her wedding finery, and Rajesh notices that something is amiss. He nevertheless goes ahead and makes a will which divides his property between Meena and Shekar. 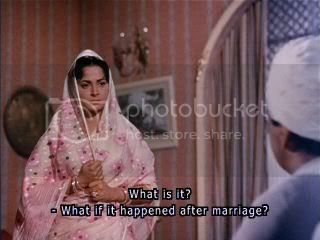 He also decides to reveal his deep, dark secret to Meena, and that evening takes her to the enigmatic cupboard. 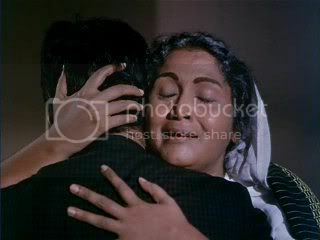 While Meena is upset by what he tells her (which shall remain mysterious here), she reaffirms her willingness to stay at his side. However, it is now Meena's turn to get confronted by the voice of conscience. 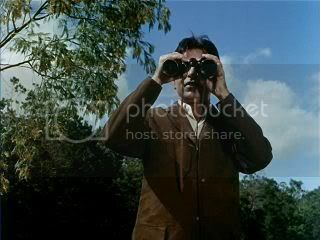 Given the fact that Rajesh was so honest with her, she wants to reciprocate and tell him the truth about her and Shekar. Shekar still refuses to do this, and when she leaves his room, she is spotted by Aarti who accuses her of having an affair with Shekar. Their conversation in turn is overheard by Rajesh. 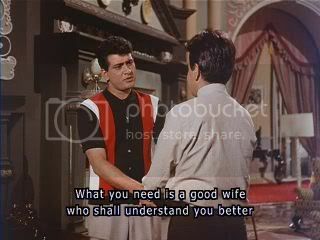 Rajesh seems to have taken advanced classes in getting the wrong end of the stick and is convinced that Aarti is being mean to Meena because she wants to marry Shekar. Not much later, Rajesh overhears Meena's father accusing her of having an affair with Shekar, as Aarti had words with Parvati. Poor Rajesh is shaken by the news and finds himself confronted by a giant size version of himself as he tries to sort out what to do. 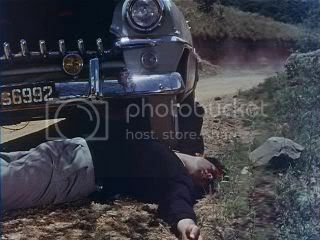 Nevertheless, the three set out on a picnic the next day which culminates in a fight between Shekar and Rajesh during which the true nature of the relationship between Shekar and Meena is revealed; and Rajesh throwing himself of a cliff. Is there any hope for Shekar and Meena's relationship? What is the deep and dark secret? Will Mayadas ever be punished for all the havoc he caused? And, most importantly, is Rajesh really dead? This is really quite heavy on the melodrama. After the interval, everybody is unhappy. It is brilliant! Well, if you like this sort of thing. If you are intolerant to noble renuniciation (mostly by females) and fervent devotion to duty, this isn't the movie for you. It is very well acted and I liked the music a lot. The motivation of the characters made sense to me, even if I don't always agree with their actions. 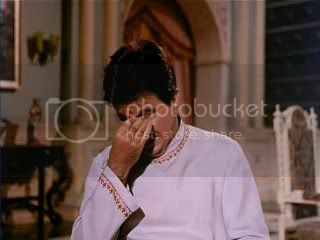 Hmm... so Manoj learnt to hide his face from Dilip Kumar! 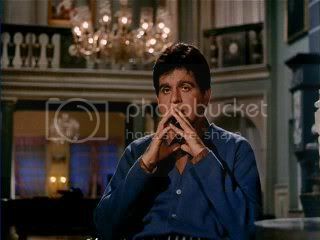 I vaguely remember seeing this looooong ago and liked the melodrama overload, then, as it came packaged with Rafi's angsty songs (I loooove Aaj puraani rahon se). 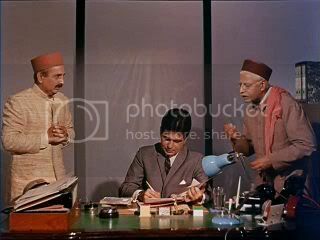 The only fly in the ointment was Dilip who I thought looked so old and boring that even Manoj Kumar looked attractive compared to him! PS: love the new layout. 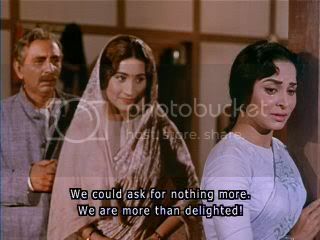 Bollyviewer -- I thought it was time to make the blog ever so slightly more colourful. The songs are lovely, I am no expert on music, which is why I don't write much about it, but they really contributed to the movie. 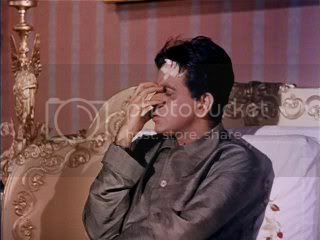 Dilip didn't bother me, in fact I rather liked him here, but each to their own. Lol i love movies that have characters who have an affinity towards their playthings. 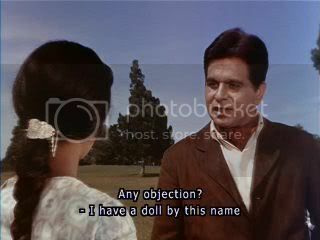 And Dilip really impressed me here, though he did look pretty old, but alas manoj was there! 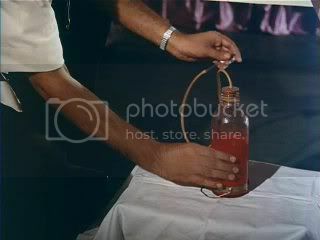 Rum -- I was impressed with Dilip, too. I didn't mind the age, as the story strongly suggested that he was a fair bit older than Manoj.